Abstract: Current state of knowledge of the atmospheres of Pluto and other TNOs is summarized. Observations of Pluto's atmosphere include spectral data and stellar occultation observations. 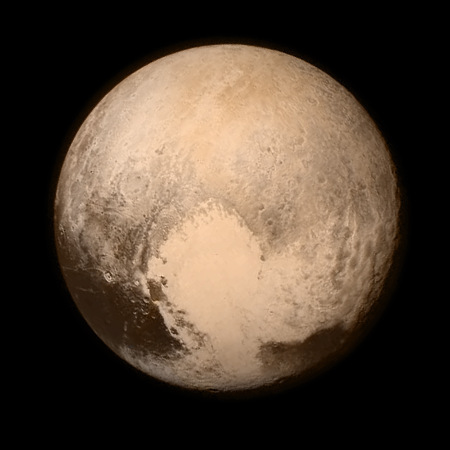 Along with knowledge of Pluto's physical characteristics these provide some constraints on atmospheric models. Pluto's atmosphere is probably mostly nitrogen with some methane. The surface pressure is of order 10-100 µbars, although this is poorly constrained. Stellar occultation data have been interpreted as indicating a temperature inversion or a haze layer in the lower atmosphere. Pluto's atmosphere is extended, possibly involving hydrodynamic escape and a comet-like envelope. Since the atmosphere results from sublimation of surface ices, it varies with time, freezing out as bright surface frosts when Pluto is further from the Sun. Aspects of Pluto's atmosphere resemble those for Triton, for which Voyager 2 observed hazes and geyser-like plumes. Other large TNOs may have similar transient atmospheres, given higher albedos suggestive of frost-covered surfaces. The New Horizons mission, launched in 2006 for Pluto flyby in 2015, will provide the first closeup observations of Pluto's atmosphere. Pluto is somewhat of a transitional object in our solar system. It is also the only "planet" not yet explored by space probes. While classified as a planet by the IAU until 2006, for over a decade it has been understood to be the first discovered member of the class of outer solar system minor planets called trans-Neptunian objects (TNOs) or Kuiper Belt objects (KBOs). To clarify the connection between Pluto and these objects, the history of knowledge of Pluto is briefly reviewed. Physical characteristics of Pluto relating to its atmosphere are reviewed. 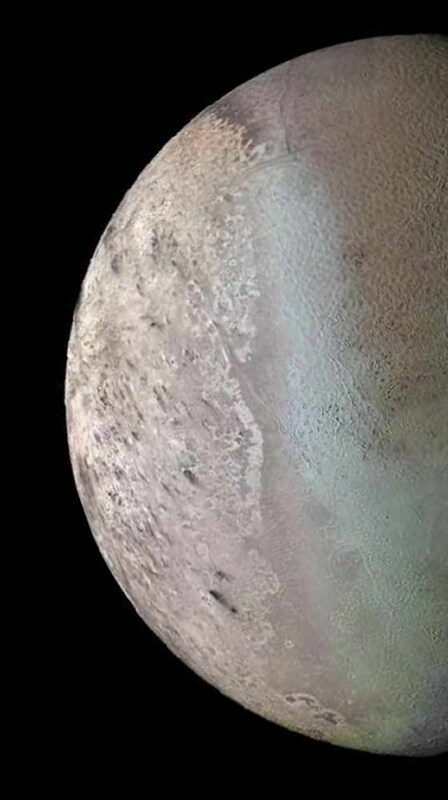 Since Voyager 2 imagery of Triton, the largest satellite of Neptune, showed atmospheric phenomena that could relate to Pluto, this data is discussed. Then observations concerning Pluto's atmosphere and associated models are reviewed. Finally, this is related to possible atmospheres of other TNOs and to future exploration of Pluto. Pluto's former status as a planet (in IAU nomenclature) reflects the past gaps in our knowledge of the outer solar system. Following discovery of Neptune in 1846, astronomers deduced the existence of a ninth planet based on observed perturbations in the orbital motion of Uranus and Neptune. The estimated mass of this hypothesized planet was thought to be 3-10 times that of the Earth. Pluto was discovered in 1930 by C. Tombaugh in the course of a search for this "Planet X." This association with the hypothesized Planet X, along with the assumption of an albedo comparable to rocky terrestrial planets, led to decades of overestimation of the size of Pluto. With a maximum magnitude of 13.7 and no resolvable disk as seen from Earth, little data on Pluto was available for decades. Improved dynamical observations indicated progressively smaller estimates of Pluto's mass; indeed, the original perturbations that led to the search that found Pluto were subsequently found to be artifacts of inaccurate orbital data. Only with the discovery of a satellite in 1978, named Charon, would Pluto's mass be accurately determined (now known to be 0.0021 Earth masses). The historical trend in estimated mass for Pluto was facetiously depicted by Dessler and Russell (1980) (Fig. 1) (see also the historical review by Stern and Mitton, 1998). Fig. 1. Historical estimates of Pluto's mass, including mass estimates for "Planet X" prior to Pluto's discovery. From Stern and Mitton (1998), after Dessler and Russell (1980). The discovery of Pluto's largest satellite came at a fortuitous time, since it permitted observation of mutual eclipses and occultations between the two bodies occurring from 1985 to 1990 (Fig. 2). (The next such series of mutual events will begin in 2109.) Telescopic observations of these events permitted the derivation, for both Pluto and Charon, of their diameters (~2360 km and 1212 km, respectively), densities, and crude surface maps. Pluto's disk was also directly imaged for the first time (albeit only a few pixels wide) in 1994 by the Hubble Space Telescope (Stern et al., 1995). Fig. 2. Artist's rendering of Pluto and Charon during a mutual event. K. E. Edgeworth and G. Kuiper had suggested the presence of a belt of icy minor bodies beyond the orbit of Neptune. This was anticipated based on models of solar system formation and requirements for a source of comets. In 1992 the first such object was discovered, and since then 1,098 objects have been catalogued (as of May 2006) (MPC, 2006). Observed dynamical classes include classical Kuiper belt objects, generally orbiting in low eccentricity orbits (e < 0.2) from 40-50 AU or in dynamical resonances with Neptune (as in the case of Pluto). Scattered disk objects are those with perihelia in the classical Kuiper belt but with aphelia far beyond. One object in a more distant orbit is known, (90377) Sedna, suggesting a population of more distant objects. Collectively, these are referred to here as TNOs in order to include objects other than the classical KBOs. Fig. 3 shows orbital eccentricity vs. semimajor axis for these objects. Fig. 3. Eccentricity vs. semimajor axis for outer solar system objects known through May 2006. Blue lines correspond to constant perihelion distance. Based on data from MPC (2006). Discovery of TNOs had prompted a mild debate over whether to classify Pluto as a planet or TNO (in terms of IAU nomenclature, TNOs are classified along with asteroids as minor planets). In 2005 discovery of three large TNOs, one--(136199) 2003 UB313--certainly larger than Pluto (Brown et al., 2005; Bertoldi et al., 2006), intensified this debate. The IAU's review of an official semantical classification (Peplow, 2006) culminated in two resolutions at the 2006 meeting redefining planets and classifying Pluto as a dwarf planet, i.e. 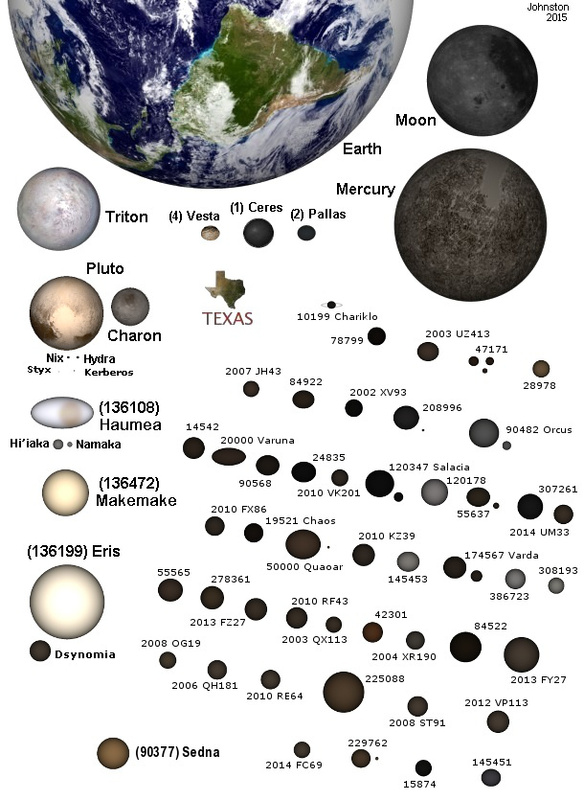 as a sub-class of small solar system bodies rather than of planets (IAU, 2006). The new definition has not been accepted by some in the planetary astronomy community (Sykes and Stern, 2006). This debate over nomenclature, however, should not cloud the issue of the taxonomic nature of these bodies: Pluto is one of the largest members of the class of TNOs, a class distinct from the larger terrestrial planets and jovian planets of our solar system. By virtue of its size, Pluto (and probably (136199) 2003 UB313 as well) may also be distinguished from the smaller TNOs in some regards, notably by the (transient) presence of an atmosphere. Table 1 lists basic data on Pluto. Pluto has a higher eccentricity, higher inclination orbit than any other planet. With its distance to the Sun ranging from 29.7 AU to 49.3 AU, Pluto when near perihelion is closer to the Sun than Neptune (a=30.1 AU). Pluto is in a 3:2 orbital resonance with Neptune (Neptune completes three orbits for every two Pluto completes), which protects Pluto from close encounters with Neptune. diameter 2304 ± 13 km or 2412 ± 22 km 1212 ± 3 km 46-137 km? 61-167 km? rotation period 6.3872304 d 6.3972304 d ? ? mass (1.305±0.007)x1022 kg (0.152±0.006)x1022 kg ? ? density 1.92 ± 0.12 g/cm3 1.63 ± 0.07 g/cm3 ? ? gravitational acceleration, surface 0.62 ± 0.04 m/s2 0.28 ± 0.01 m/s2 ? ? obliquity 122.52 -- ? ? albedo 0.6, regional 0.3-0.8 0.37±0.02 ? ? Table 1. Basic data on Pluto and its satellites. Orbital inclination is relative to the ecliptic for Pluto and relative to the orbit of Charon for satellites. For comparison, solar B-V is 0.67. Most data from Buie et al. (2006), JPL (2005), Lodders and Fegley (1998), Olkin et al. (2003), Person et al. (forthcoming), Stern et al. (2006a), and Stern et al. (2006b). In many regards Pluto and Charon must be considered together. Charon is larger relative to its primary than any other planetary satellite. The two are tidally locked with respect to each other, with both rotation periods equal to Charon's orbital period of 6.39 days. Values for mass and size (and hence density) are derived primarily from dynamical and mutual event observations. For Pluto, the results constrain its density to 1.92±0.12 g/cm3. This in turn implies a surprisingly high rock fraction of 0.6-0.8 (presuming a mix of the most abundant silicates and ices) (Olkin et al., 2003). If Pluto is differentiated, its rock core radius is 0.6-0.75 of the planet radius, with H2O and CH4 probably the primary ice species above this. Core temperature could be in the range 100-200 K (Stern and Yelle, 1997). Currently an impact origin is the favored model for origin of Charon. This model has been used to explain the high abundance of rock in Pluto, which is at odds with typical volatile fractions in the outer solar system; some studies suggest the impact origin may not solve this issue (Canup, 2005). Methane ice was identified in the spectrum of Pluto in 1976 (Cruikshank et al., 1976). In 1992 N2 and CO ices were identified on Pluto (Owen et al., 1993). Water and ammonia ices, however, have not been detected, although both have been identified in the spectrum of Charon (Brown and Calvin, 2000; Cook et al., 2006). In 2005 two more satellites of Pluto were discovered. Designated S/2005 P1 and S/2005 P2 and subsequently named Hydra and Nix, respectively, both have nearly circular orbits outside the orbit of Charon but in nearly the same plane as Charon (Weaver and Stern, 2005; Buie et al., 2006). Assuming albedoes similar to that of Charon, the two satellites would diameters of about 50-60 km. The inner satellite Nix has a neutral color similar to Charon, while the outer satellite Hydra has a slightly redder spectrum than Pluto (Buie et al., 2006). Data on both satellites is given in Table 1. While the surface maps of Pluto are of low resolution and are ambiguous, they do provide insights regarding its surface. The surface markings range significantly in albedo, from 0.3 to 0.6 (Reinsch et al., 1994), with smaller areas significantly brighter (Young et al., 2001). There is a significant asymmetry, with the sub-Charon hemisphere significantly darker than the other hemisphere. The polar regions are generally brighter. Two multispectral maps have been produced, one constructed from mutual events (Young et al., 2001, see Fig. 4) and one from Hubble observations (Buie et al., 2005). They both show significant color variations, with a generally red spectrum interrupted by grey (flat spectrum) areas. Some maps identify a bright localized spot (albedo > 0.8) in the sub-Charon hemisphere near latitude 17° N, longitude 33° E (Young et al., 1999). Fig. 4. Color map of Pluto's sub-Charon hemisphere, based on two-color mapping from mutual event data. The dark equatorial band is typical of derived Pluto maps. Modified from Young et al. (2001). Pluto is the largest object in the solar system not yet explored by spacecraft, excepting larger TNOs. However, the Neptunian satellite Triton resembles Pluto in terms of size, apparent composition, and general atmospheric characteristics. Triton was explored in 1989 during the Voyager 2 flyby. Some of the resulting insights relate to Pluto, so we briefly consider Triton's atmosphere as a point of reference. Note that in some regards (notably interaction with Neptune's magnetosphere and potential internal tidal heating), Triton is very different from Pluto. Triton is the largest satellite of Neptune, with a diameter of 2704 km. Its average density of 2.05 g/cm3 implies a mix of rock and ices, including water ice, but with a greater fraction of rock. The Voyager 2 flyby showed Triton to have a thin atmosphere with a surface pressure of about 15 µbars and a scale height of about 15 km. This atmosphere is mostly N2, and the surface temperature is 38 K (Triton has a high albedo, about 0.70) (Lodders and Fegley, 1998). Stellar occultation data suggest the atmospheric temperature is about 51 K from 30 to 50 km altitude, with a positive temperature gradient of 0.4 K/km above this (Elliot et al., 2003b). Voyager 2 images suggest a layer of frost in the winter hemisphere (Fig. 5), consistent with the expectation that the thin atmosphere of sublimated ices would freeze out in colder regions. Stellar occultation observations showed Triton's atmosphere to have expanded by 1997, when the surface pressure was estimated at 20 µbars (Elliot et al., 2000). This is consistent with seasonal changes in isolation of polar regions which have exposed more polar frost to sunlight, causing sublimation of more gas. Further evidence of such volatile transport comes from observed large-scale changes in Triton’s albedo and color (Flynn et al., 2001). Fig. 5. Voyager 2 photomosaic of Triton. Bright bluish areas in the middle (corresponding to Triton's equator) are probably frost deposits. Dark streaks, or maculae, near the bottom are probably aerosol deposits downwind of geysers. The largest maculae are near latitude 30° S. NASA image. Voyager 2 images of Triton's limb showed a layer of haze suspended in the atmosphere. The global averaged optical depth is in the range 0.034 to 0.063 (depending on wavelength), but clouds with three times this opacity were typical at 50-60° S (Hillier and Veverka, 1994). Based on fits to scattering models, aerosol particle sizes have been estimated at 0.17 µm for the low latitude thin hazes and 0.25 µm or 0.7-2.0 µm for clouds closer to the south pole (Rages and Pollack, 1992). In addition, Voyager 2 imaged multiple erupting geysers (more accurately, cryovolcanoes) producing plumes of dark material (Fig. 6), typically rising to 8 km altitude before drifting hundreds of km downwind in the thin atmosphere (Hansen et al., 1990). These were concentrated in the same latitude region as the thickest clouds. Some models for these geysers involve internal heat associated with tidal heating, a phenomena that would not apply to Pluto. However, some models involve solar heating (Kirk, 1990; Brown et al., 1990; Duxbury and Brown, 1997), which could occur on Pluto. In this model, translucent nitrogen ice allows solar radiation to heat the subsurface layers ~1 m deep to temperatures a few degrees higher than the surface. This could drive extended regions of venting which lift dark aerosols comprising the plumes. Such plumes could remain active for months or longer. Fig. 6. Voyager 2 image of erupting geyser on Triton. Lower copy of the image includes arrows indicating (from right to left) the vertical geyser plume, the shadow and downwind plume. NASA image. Despite limited data, it is clear that Pluto has an atmosphere unique among those studied to date. Pluto's atmosphere was first suspected following the spectral identification of methane ice in 1976, since methane ice would sublimate at Pluto's equilibrium temperature. In 1994 methane was first directly detected in Pluto's atmosphere; these observations imply a low fraction of CH4 (less than 1%). In 1988 a stellar occultation by Pluto was well observed (Elliot et al., 1989; Millis et al, 1993). The lightcurve, shown in Fig. 7, confirmed the presence of an atmosphere. Significantly the lightcurve shows a discontinuity in slope at a distance from Pluto's center of R=1215 km. Above this height the derived ratio of temperature to mean molecular weight is T/m=3.63±0.33 K/amu. The dominant atmospheric gas is believed to be N2. Spectral observations indicate that nitrogen ice dominates among surface materials, and at the thermally-derived surface temperature of 42±2 K (Gurwell and Butler, 2005), nitrogen would sublimate to form a low pressure atmosphere. For a mostly N2 atmosphere, the temperature at R=1215 km is 102±9 K. This positive temperature gradient from the surface is consistent with warming by CH4, although arguments favoring heating by aerosols have also been offered. Fig. 7. Intensity profile for stellar occultations by Pluto. From Stern and Mitton (1998), after Elliot et al. (1989). The atmosphere below R=1215 km is poorly constrained, as is the location of the surface. The main models are summarized in Fig. 8. Several authors suggest the lightcurve discontinuity results from a steep positive temperature gradient, placing the surface at R=1195 km. For such clear atmosphere models, the required temperature gradient is of order 4 K/km just below the R=1215 level (Elliot et al., 2003b). Both results are in significant disagreement with results from mutual event data, which place Pluto's radius at R=1160 km. One solution is a temperature inversion, with a negative temperature gradient in a troposphere and a steep positive gradient above this (Stansberry et al., 1994). Fig. 8. Structure of Pluto's atmosphere in various models. Temperature gradient is slight above R=1215 km. Below that, haze models and positive/inverted temperature gradient models differ markedly. From Elliot and Kern (2003). Based on the lightcurve data, Elliot et al. (1989) suggest a haze layer at and below R=1215 km, in which case the surface is at least 35 km lower at R<1180 km. The haze layer would have to be optically thin at high angles, since surface features are reproducibly observed, but optically thick near the limb. If true, this could help reconcile stellar occultation and mutual event observations. The phase function of Pluto is poorly constrained and affects interpretation of mutual event data (Young and Binzel, 1994); a haze layer producing significant extinction at the limb could reconcile this data with the larger radius values. Due to the uncertainty in Pluto's radius, the surface pressure is poorly constrained to somewhere between 10 and 100 µbars. Model temperature profiles are shown in Fig. 9. Modeling has been used to offer constraints on the surface abundances of various ices, assuming that the atmosphere is in equilibrium with sublimation of N2, CH4, and CO ices from the surface. Fig. 9. Temperature profiles for lower/middle atmosphere of Pluto for various CH4 abundances. Different curves indicate different CH4 fractions at the surface (g0) and different models for dependence of CH4 fraction on altitude (b). From Strobel et al., 1996. Observations and models to date support the interpretation that Pluto's atmosphere represents equilibrium sublimation of surface ices due to solar heating. Fig. 10 summarizes the processes in the atmosphere of Pluto. The atmosphere is (approximately) in equilibrium between sublimation of surface ices due to solar heating and condensation of atmospheric gases in colder regions. The atmospheric pressure estimated from observations is consistent with equilibrium vapor pressure for Pluto at its surface temperature. Fig. 11 plots vapor pressure vs. temperature for various known or possible ices on Pluto. Although only one curve is shown for CH4, other curves are possible for different ice phases (Eshleman, 1989). Comparison of vapor pressures of known ices on Pluto's surface strongly argues for N2 being the primary atmospheric constituent, with CH4 and CO also present. Fig. 10. Processes in Pluto's atmosphere. From Elliot and Kern (2003). Fig. 11. Vapor pressure vs. temperature for various ices in a bound atmosphere. From Elliot and Kern (2003). Given an atmosphere of N2 with some CH4, photochemical processes will dissociate CH4 and produce free hydrogen as well as a variety of hydrocarbons. Lara et al. (1997), in a model with 0.74% CH4 and 0.046% CO, obtain abundances at 100 km altitude of ~10 ppm for C2H6, C2H2, and HCN, along with ~300 ppm of H2. If hydrocarbons are present and form haze particles, these should also settle to the surface. Recent spectral observations support this view, with reports suggesting the presence of tholins (Olkin et al., 2005) including condensable photochemical products (Sasaki, 2005). If Pluto has geysers like those of Triton, this provides an additional source for haze aerosols. Models of Triton's geysers involving solar heating of nitrogen ices could apply to Pluto as well. Such geysers could, as on Triton, produce locally thick haze clouds or wind-driven plumes. Solar heating on Pluto is highly variable, both temporally and spatially. During Pluto's 248-year orbit, mean solar isolation varies by a factor of 2.8 from perihelion to aphelion, and additionally varies greatly at specific locations with season due to Pluto's high obliquity. At any given time, the significant range in albedo between surface regions would cause significant differences in solar radiation absorption and temperature. These effects are illustrated in Fig. 12, which shows calculated equilibrium temperature for the equator and poles during a complete orbit, assuming an emissivity of 0.8 and various values of surface albedo. (Flux is averaged over one rotation period of Pluto, which is 6.39 days; consequently, the figure does not reflect significant diurnal variations.) Pluto was last at perihelion in 1989, which also nearly coincides with spring equinox in 1987 (for the current orientation of Pluto's rotation axis, which precesses on timescales of 106 years). The north polar region of Pluto is currently entering a decades-long period of sunlight and may attain temperatures greater than mean equatorial temperatures at perihelion. Fig. 12. Equilibrium temperatures at different locations on Pluto's surface vs. year, covering one orbital period. Calculations assume emissivity=0.8 and average flux over Pluto's 6.39-day rotation period but otherwise assume no thermal inertia/heat transfer; albedo a is variously taken as 0.3 or 0.6. These seasonal/orbital temperature variations should produce significant changes in the atmosphere, as the equilibrium vapor pressure for Pluto's atmospheric constituents is very temperature dependent (Fig. 11). In addition to observable changes in the atmosphere, associated changes in volatile transport and deposition as frost should produce significant albedo changes (Hansen and Paige, 1996). Photometric observations do indicate a 25% decrease in mean albedo from 1954 to 1986 and an increase in the rotational lightcurve variation from 13% to 32% (Brown, 2002), although much of this change may be due to changes in the viewing geometry of the system (Buratti et al., 2003). Spectral observations correlated with Pluto's lightcurve have not shown changes in distribution of surface ices between 1995 and 1998 (Grundy and Buie, 2001). Observations of Pluto's atmosphere during a stellar occultation in 2002 revealed that pressure at the R=1215 km height had doubled from about 2.5 µbar in 1988 to 5 µbar (Elliot et al. 2003a; Sicardy et al., 2003). The derived temperature at this height was virtually unchanged at 104±2 K. This atmospheric expansion contrasts with expectations that Pluto's atmosphere will freeze out as it recedes from perihelion. Some possible explanations include high thermal inertia or darkening of surface materials (Pasachoff et al., 2005). Nonetheless, this trend is expected to reverse in the years ahead, with a significant decrease in Pluto's atmospheric thickness over the next few decades. Stansberry and Yelle (1999), however, suggest that buffering by different phase-states of nitrogen ice could permit Pluto to retain a significant atmosphere for much of its orbital period. In their model, as Pluto cools atmospheric nitrogen will increasingly solidify in the alpha phase-state (versus the beta phase-state for warmer conditions). The alpha phase has a much lower emissivity (0.3 versus 0.75), which could result in extended periods of surface temperature near 36 K despite a halving of solar insolation. The emissivity of surface ices on Pluto is an issue for modeling surface temperatures and sublimation of ices (Lunine et al., 1989). Spatial variations in Pluto's atmosphere could be associated with the regional albedo variations. Hemispheric ranges in albedo are as great as from 0.3 to 0.6 and local variations are significantly greater. Thermal observations in 1997 indicated surface regions with temperatures ranging from 40 K to 50-60 K (Lellouch et al., 1998), as expected from variations in absorbed solar radiation. Later observations and modeling indicated peak daytime temperatures of 54 to 63 K depending on albedo region, with some regions towards the south pole below 40 K (Lellouch et al., 2000). Consequently, atmospheric pressure may vary significantly with location. Pluto's low gravity (its surface gravity is 6% of the Earth’s) contributes to a significantly extended atmosphere. The scale height in Pluto's atmosphere is about 19 km at the surface and about 50 km at R=1215 km, where the temperature reaches 102 K. Consequently, despite the very low surface pressure, the number density at altitudes greater than about 100 km exceed those at similar altitudes above the Earth. This is illustrated in Fig. 13, which includes model neutral and ion densities in Pluto's atmosphere. Fig. 13. Comparison of neutral and ion number densities for the atmospheres of Pluto and the Earth. Neutral atmosphere data for Pluto is based on Lara et al. (1997) and Elliot et al. (2003b). Pluto ionosphere data is from Ip et al. (2000) for (1) and Krasnopolsky and Cruikshank (1999) for (2). Earth neutral and ionosphere densities are generally variable; illustrative data here is from GSFC (2005). where G is the gravitational constant, M is Pluto's mass, m is the mean molecular mass, k the Boltzmann constant, T the temperature, R the radial distance, and h the scale height. For large L>, bulk escape of atmospheric gas (hydrodynamic escape) becomes more important than Jean's escape (escape by individual molecules with sufficient thermal speeds). For Pluto, stellar occultation data indicates L=22, the smallest value for any observed atmosphere. Consequently, escape of Pluto's atmosphere must be modeled hydrodynamically instead of by Jean's escape. With hydrodynamic escape, the thermosphere is significantly cooler than implied by hydrostatic treatments. Initial modeling (McNutt, 1989) for methane atmospheres found relatively low escape rates, in contrast to subsequent work considering additional species. Krasnopolsky (1999) found escape rates for N2 of order (2-2.6)x1027 molecules s-1, corresponding to about 0.05% of Pluto's mass over the age of the solar system. Tian and Toon (2005) found N2 escape rates an order of magnitude greater, of order (1-3)x1028 molecules s-1, corresponding to about 0.5% of Pluto's mass over the age of the solar system. The nature of Pluto's interaction with the solar wind involves several possible cases (PSDT, 1999) (Fig. 14). If Pluto has no magnetic field (which seems likely, based on expected composition and lack of internal heat to produce a convective dynamo), the upper atmosphere would interact directly with the solar wind. Alternately, even a weak magnetic field could drive solar wind interaction. Recent suggestions that Pluto could have a subsurface liquid water ocean (Hussmann et al., 2005) might permit sufficient magnetic field. Alternately, bulk magnetization comparable to that for meteorites would be sufficient to have an effect, given the weak IMF at Pluto's distance from the Sun (~0.1 nT). 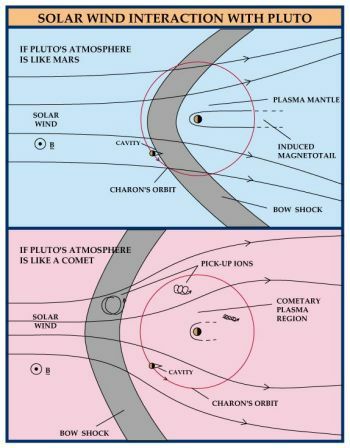 The case of no (or very weak) magnetic field involves two extremes: interaction with a gravitationally-bound atmosphere (like Venus) and interaction with a freely evaporating atmosphere (like comets). The divergence between these cases occurs for Pluto at an outflow rate of about 1.5x1027 molecules s-1. Below this value, Pluto's solar wind interaction will be like that of Venus, where the solar wind interacts directly with a well-defined ionosphere. However, the current estimates of outflow from Pluto favor the cometary interaction. In this case, there could be an extended region around Pluto with heavy mass-loading of the solar wind and a lack of a distinct bow shock. Conditions would be quite different from those near comets in the inner solar system; the gyroradius for ions "picked up" from Pluto's atmosphere by the solar wind IMF is of order 7x105 km (Delamere and Bagenal, 2004). Fig. 14. Solar wind interaction with Pluto's upper atmosphere in two models. From NASA (2005). Currently, models of Pluto's ionosphere are poorly constrained. Krasnopolsky and Cruikshank (1999) find a peak ion density of 800 cm-3 at about 2250 km altitude, with the most abundant ions being HCNH+, C3H3+, and C3H2+. They concluded that photoionization is less important than cosmic rays for ion production below about 1500 km. In contrast, Ip et al. (2000) find a peak ion density of about 3000 cm-3 at about 800 km altitude, declining to 1000 cm-3 at 1600 km altitude, with H2CN+ the major ion below about 1200 km. Most important ions at higher altitudes included N+, N2+, and CH3+. Further, they found that if Pluto does not have an intrinsic magnetic field, the solar wind and IMF will penetrate to about 1400 km altitude. Models for various magnetic field strengths suggest that the effect of any weak magnetic field will be limited to near the planet. Delamere and Bagenal (2004) found that, even for small rates of atmospheric escape, that Pluto would be surrounded by an extended plasma envelope including notable deflection of solar wind protons. Rapid solar wind pickup of heavy ions from Pluto's atmosphere may result in the lack of a well-developed ionosphere (Sauer et al., 1997). Atmospheres have not yet been identified for any other objects beyond Neptune, which is unsurprising given the challenges of observing these objects. Available data does indicate the possibility of TNO atmospheres. Of known TNOs, one is larger than Pluto and possibly five are between Charon and Pluto in size. These objects reflect the apparent compositional diversity of TNOs, with consequent implications for atmospheres. Further, the largest TNOs have albedos comparable to that of Pluto, suggestive of surface frosts linked to a transient atmosphere. Pluto's satellite Charon does not have a detectable atmosphere, which is consistent with its surface composition (less volatile ices than Pluto's surface) and smaller size (less ability to retain an atmosphere). In notable contrast to Pluto, spectral observations of Charon indicate the presence of water ice and ammonium hydrates, but not of methane or nitrogen ices (Brown and Calvin, 2000; Cook et al., 2006). Surface ices on Charon have higher sublimation temperatures than those on Pluto; combined with a lower escape velocity, this leads to little expectation of a significant atmosphere on Charon. Stellar occulation observations in 1980 placed upper limits on any atmosphere (Elliot and Young, 1991); these limits were significantly improved by observations of another stellar occultation by Charon in July 2005. No indication of an atmosphere was found in these observations, with upper limits for atmospheric surface pressure dependent on the constituent gas assumed: 110 nbar for N2, 15 nbar for CH4, and about 220 nbar for H2O (Sicardy et al., 2006; Gulbis et al., 2006). Of the increasing population of identified TNOs, all (excepting one TNO identified in 2005) are fainter than Pluto, with the associated challenges of determining any physical characteristics. Until recently, the sizes of TNOs could only be estimated by assuming a value for albedo, the traditional choice being 0.04 (similar to that for comet nuclei). In the last few years various methods have been applied to deduce albedos for particular objects: combined thermal infrared and visual observations; direct imaging for a few large TNOs; and constraints from dynamical observations of binary TNOs. Initial data suggested a trend for higher albedos for larger TNOs (e.g. those over 700-1000 km in diameter). This would be consistent with possible frost deposits on larger objects, where a thin atmosphere could be retained. There is now doubt as to whether such a size-albedo correlation exists. Grundy et al. (2005) reviewed albedo determinations (or lower limits) for 20 TNOs and found no clear trend. Dynamically-determined albedos for smaller TNOs indicate a wide range, generally higher than the traditional value of 0.04. The possibility remains that results for small binary TNOs are not representative. Additionally, recent determinations of TNO densities suggest a wide range--from 2.6-3.3 g/cm3 for 2003 EL61 (Rabinowitz et al., 2006) to 0.3-0.8 g/cm3 for (47171) 1999 TC36 (Stansberry et al., 2006)--with consequent uncertainties for dynamical derivation of albedos. In any case, currently determined TNO albedos (through 2005) average about 0.09 with no clear trend with size (up to sizes comparable to Charon). In the case of the largest objects, different conclusions are in order. In 2005 discoveries of three large TNOs were announced: (136199) 2003 UB313, (136472) 2005 FY9, and (136108) 2003 EL61. All three appear to be comparable to Pluto in both size and albedo, making them significantly different from other known TNOs. Data on these and other large objects beyond Neptune are given in Table 2. (136108) 2003 EL61 0.44 1380± 60 0.66±0.06 2.97±0.37 0.63 H2O, ? (90482) Orcus 2.27 600-1550 0.04-0.3 -- 0.68 H2O, ? Table 2: Physical characteristics of the largest trans-Neptunian objects. Diameters/albedos for (136472) 2005 FY9, (90377) Sedna, and (90482) Orcus are poorly constrained, but the larger diameter figures are preferred. For comparison, solar B-V is 0.67. See table 1 for sources of Pluto/Charon data. TNO data from Barucci et al. (2005a), Barucci et al. (2005b), Bertoldi et al. (2006), Brown and Trujillo (2004), Brown et al. (2006), Buie et al. (2006), de Bergh et al. (2005), Jewitt and Luu (2004), JPL (2006), Licandro et al. (2006), Rabinowitz et al. (2006), Tegler et al. (2003), Trujillo et al. (2004), Trujillo et al. (2005b), Trujillo et al. (forthcoming). Among the newly announced objects, (136199) 2003 UB313 is larger than Pluto. Spectra for both (136199) 2003 UB313 and (136472) 2005 FY9 shown the presence of methane ice, and both have a red spectra like that of Pluto (Brown et al., 2005; Licandro et al., 2006). The spectra of (136108) 2003 EL61, in contrast, is neutral and shows the presence of water ice but not methane, similar to Charon (Trujillo et al., forthcoming). In addition, the discovery of satellites to (136108) 2003 EL61 and observations of its lightcurve have been interpreted to constraint its shape and density. These results indicate a very elongated body with an unusually high density--between 2.6 and 3.34 g/cm3., and its albedo to 0.6 or greater (Rabinowitz et al., 2006). The uniqueness of these larger TNOs is illustrated in Fig. 15, which compares large TNOs (estimated diameter of 700 km or more) to other representative solar system objects in relative size, color, and albedo. Fig. 15. Comparison of the largest outer solar system objects, depicting relative sizes, colors, and albedos. (136199) 2003 UB313 was found to have a diameter of 3000 km and an albedo of 0.60 based on Spitzer telescope observations in 2006 (Bertoldi et al., 2006). Shortly afterward, Hubble Space Telescope imagery was used to obtain a diameter of 2400 km and an albedo of 0.87 by Brown et al. (2006). If the latter measurement proves correct, the extremely high albedo is difficult to explain without a transient atmosphere. The Brown team suggests that (136199) 2003 UB313 has an atmosphere near perihelion which virtually completely freezes out as bright frost deposits. They calculate for (136108) 2003 UB313 at perihelion an equilibrium temperature of 43 K and atmospheric pressures of 30 Pa and 0.2 Pa for solid N2 and solid CH4 surfaces, respectively, with these pressures 6 to 8 orders of magnitude lower at its current distance of 97 AU and temperature of 27 K.
Color and spectral observations of the largest TNOs suggest two types of objects, typified by Pluto and Charon: red spectra, with methane ice the most identifiable surface component (Pluto); and neutral spectra, with water ice the most identifiable surface component (Charon). Given the small number of such objects observed, these may represent two extremes of a continuous range in characteristics. A wide range in color (from neutral to red) is well identified for the general TNO population. Some correlations between these colors and orbital elements have been suggested, such as redder spectra for classical TNOs with larger perihelion distances (Doressoundiram et al., 2005). The significance for objects large enough to retain an atmosphere is whether ices are present that can sublime into gas at the temperatures of these objects, ices such as methane and nitrogen. As previously discussed, the high albedo regions of Triton and Pluto are identified as frost deposits from freezing of atmospheric gases. The Pluto-like albedos of the largest TNOs thus suggest the possibility of atmospheres for these objects, where such atmospheres are limited to those objects sufficiently large to retain transient atmospheres. For one object besides Pluto, the (currently unique) Oort cloud object (90377) Sedna, spectral evidence for nitrogen ice has been reported. Sedna has a diameter of up to 1800 km with a range in distance from the Sun of 76 AU to 913 AU. Spectra obtained in 2005 showed the presence of nitrogen and methane ices, from which it is suggested that Sedna could have a thin N2 atmosphere for about 200 years near perihelion (Barucci et al., 2005a). Its albedo is unknown, but is at least 0.05 based on a lack of detection in Spitzer Space Telescope thermal observations. Determination of its albedo will constrain models of its surface properties, which already indicate that neither CH4 nor H2O ice is the dominant surface constituent (Trujillo et al., 2005a). A few efforts to directly observe TNO atmospheres have been conducted. Hainaut et al. (1999) review several findings, including HST detection of a coma around (15820) 1994 TB and a dramatic change in the rotational lightcurve of (19308) 1996 TO66, possibly due to a cometary outburst. While (15820) 1994 TB is relatively small (about 170 km diameter for an albedo of 0.09), (19308) 1996 TO66 ranks among the larger known TNOs. For the latter, thermal observations place an upper size limit of 900 km (Grundy et al., 2005). The first spacecraft mission to Pluto and the Kuiper belt, NASA's New Horizons, was launched 19 January 2006 for Pluto flyby on 14 July 2015. As currently planned, the probe will pass Pluto and Charon at distances of 10,000 km and 27,000 km, respectively, with a relative velocity of 14 km/s (NASA, 2006; Covault, 2006). Besides observing Pluto and Charon, New Horizons may be targeted for flybys of one or two TNOs following the Pluto encounter. These targets will be selected later, but it is anticipated that objects 40-90 km in diameter will be chosen. Objects this small are not expected to have atmospheres, but such observations may indirectly benefit understanding of larger TNOs (regarding composition, history, etc.). Study of Pluto's atmosphere is a key objective for New Horizons involving multiple instruments (NASA, 2005) which are depicted in Fig. 16. SWAP (Solar Wind Around Pluto), a low energy particle spectrometer, will provide data on the rate of atmospheric escape and on interactions with the solar wind. It will sample particle energies ranging from 30 eV to 7.7 keV. PEPSSI (Pluto Energetic Particle Spectrometer Science Investigation), an energetic particle spectrometer, will provide plasma composition and density data. It can sample particles with energies in the range of 25 keV to 1 MeV. Two further experiments will utilize plans for the spacecraft to pass through Pluto's (and Charon's) sun shadow and Earth radio shadow. Alice, an ultraviolet imaging spectrometer, will observe extinction of sunlight associated with Pluto's atmosphere. Its resolution is 0.183 nm, covering the UV range from 52 to 180 nm. REX (Radio Science Experiment) will involve radio signals sent to Earth as Pluto occults the spacecraft, permitting conclusions regarding atmospheric temperature and molecular mass. Collectively, these instruments should constrain molecular fractions of the major atmospheric species to within 1%. In addition, the infrared imaging spectrometer Ralph LEISA (Linear Etalon Imaging Spectral Array) will constrain surface compositions which are particularly important to atmospheric composition in Pluto's case. Fig. 16. 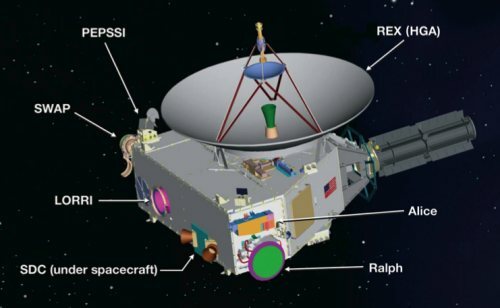 Configuration of New Horizons spacecraft instruments. From NASA (2005). Does hydrodynamic escape take place from Pluto's upper atmosphere? If so, the rate of escape affects understanding of the evolution of Pluto's surface. Is the atmosphere clear or hazy? The contrasting models involve possible warming by atmospheric CH4 versus warming by hazes, possibly produced by condensation of photochemically-produced hydrocarbons. Related to resolution of this issue is determination of Pluto's radius, a key factor in the uncertainty of the surface pressure. What atmospheric and surface phenomena occur as a result of the seasonal changes in insolation? There is considerable uncertainty as to when (or even if) the atmosphere of Pluto will show significant seasonal collapse. Do phenomena such as geysers/cryovolcanoes contribute to atmospheric hazes or composition? Unknowns regarding Pluto's geology permit notable influences on its atmosphere, one example being transport of volatiles from Pluto's interior. Additional studies of other TNOs may reveal very different atmospheres. Possible types of observations include TNO stellar occultations and, for the increasing known population of binary TNOs, mutual events. Known TNOs cover a wide range of thermal conditions, and ranges in surface composition are also indicated by current data. Discoveries in 2005 emphasize that we have yet to identify the full diversity of these outer solar system objects; interesting findings are certainly in store. Barucci, M. A., et al., 2005a, Nitrogen and methane ices on the surface of Sedna?, DPS abstract 37.56.01. Barucci, M. A., et al., 2005b, Is Sedna another Triton?, Astronomy and Astrophysics, 439:L1-L4. Bertoldi, F., W. Altenhoff, A. Weiss, K. M. Menton, and C. Thum, 2006, The trans-neptunian object UB313 is larger than Pluto, Nature, 439:563-564. Brown, M. E., 2002, Pluto and Charon: formation, seasons, composition, Annual Rev. Earth and Planetary Science, 30:307-345. Brown, M. E., and W. M. Calvin, 2000, Evidence for crystalline water and ammonia ices on Pluto's satellite Charon, Science, 287:107-109. Brown, M. E., E. L. Schaller, H. G. Roe, D. L. Rabinowitz, and C. A. Trujillo, 2006, Direct measurement of the size of 2003 UB313 from the Hubble Space Telescope, Astrophysical Journal, 643:L61-L64 [http://arxiv.org/abs/astro-ph/0604245]. Brown, M. E., and C. A. Trujillo, 2004, Direct measurement of the size of the large Kuiper belt object (50000) Quaoar, The Astronomical Journal, 127:2413-1417. Brown, M. E., C. A. Trujillo, and D. L. Rabinowitz, 2005, Discovery of a planetary-sized object in the scattered Kuiper belt, The Astrophysical Journal, 635:L97-L100. Brown, R. H., T. V. Johnson, R. L. Kirk, and L. A. Soderblom, 1990, Energy sources for Triton's geyser-like plumes, Science, 250:431-435. Buie, M. W., W. M. Grundy, E. F. Young, L. A. Young, and S. A. Stern, 2005, Mapping the surface of Pluto with the Hubble Telescope, DPS abstract 37.49.03. Buie, M. W., W. M. Grundy, E. F. Young, L. A. Young, and S. A. Stern, 2006, Orbits and photometry of Pluto's satellites: Charon, S/2005 P1 and S/2005 P2, Astronomical Journal, 132:290-298 [http://arxiv.org/abs/astro-ph/0512491]. Buratti, B. J., et al., 2003, Photometry of Pluto in the last decade and before: evidence for volatile transport?, Icarus, 162:171-182. Canup, R. M., 2005, A giant impact origin of Pluto-Charon, Science, 307:546-550. Cook, J. C., S. J. Desch, T. Roush, T. R. Geballe, and C. A. Trujillo, 2006, Near-infrared spectra of Charon: support for cryovolcanism on Kuiper belt objects?, LPI Conference, 37:2107. Covault, Craig, 2006, Warp speed, Aviation Week and Space Technology, 164(2):46-49. Cruikshank, D. P., C. B. Pilcher, and D. Morrison, 1976, Pluto: evidence for methane frost, Science, 194:835-837.
de Bergh, C., et al., 2005, The surface of the transneptunian object 90482 Orcus, Astronomy and Astrophysics, 437:1115-1120. Delamere, P. A., and F. Bagenal, 2004, Pluto's kinetic interaction with the solar wind, Geophysical Research Letters, 31:L04807. Dessler, A. J., and C. T. Russell, 1980, From the ridiculous to the sublime: the pending disappearance of Pluto, Eos, 61:691. Doressoundiram, A., et al., 2005, The Meudon Multicolor Survey (2MS) of Centaurs and trans-neptunian objects: extended dataset and status on the correlations reported, Icarus, 174:90-104. Duxbury, N. S., and R. H. Brown, 1997, The role of an internal heat source for the eruptive plumes on Triton, Icarus, 125:83-93. Elliot, J. L., et al., 1989, Pluto's atmosphere, Icarus, 77:148-170. Elliot, J. L., et al., 2000, The prediction and observation of the 1997 July 18 stellar occultation by Triton: more evidence for distortion and increasing pressure in Triton's atmosphere, Icarus, 148:347-369. Elliot, J. L., et al., 2003a, The recent expansion of Pluto's atmosphere, Nature, 424:165-168. Elliot, J. L., and S. D. Kern, 2003, Pluto's atmosphere and a targeted-occultation search for other bound KBO atmospheres, Earth, Moon, and Planets, 92:375-393. Elliot, J. L. M. J. Person, and S. Qu, 2003b, Analysis of stellar occultation data. II. Inversion, with application to Pluto and Triton, The Astronomical Journal, 126:1041-1079. Elliot, J. L., and L. A. Young, 1991, Limits on the radius and a possible atmosphere of Charon from its 1980 stellar occultation, Icarus, 89:244-254. Eshleman, V. R., 1989, Pluto's atmosphere-models based on refraction, inversion, and vapor-pressure equilibrium, Icarus, 80:439-443. Flynn, B., S. A. Stern, L. Trafton, and J. Stansberry, 2001, HST/FOC imaging of Triton, Icarus, 150:297-302. Goddard Space Flight Center (GSFC), 2005, ModelWeb web site [http://modelweb.gsfc.nasa.gov/]. Grundy, W. M., and M. W. Buie, 2001, Distribution and evolution of CH4, N2, and CO ices on Pluto's surface: 1995 to 1998, Icarus, 153:248-263. Grundy, W. M., K. S. Noll, and D. C. Stephens, 2005, Diverse albedos of small trans-neptunian objects, Icarus, 176:184-191. Gulbis, A. A. S., et al., 2006, Charon's radius and atmospheric constraints from observations of a stellar occultation, Nature, 439:48-51. Gurwell, M. A., and B. J. Butler, 2005, Sub-arcsecond scale imaging of the Pluto/Charon binary system at 1.4 mm, DPS abstract 37.55.01. Hainaut, O. R., et al., 1999, Cometary activity in TNOs: a status report, DPS abstract 31.27.01. Hansen, C. J., and D. A. Paige, 1996, Seasonal nitrogen cycles on Pluto, Icarus, 120:247-265. Hansen, C. J., R. J. Terrile, A. McEwen, and A. Ingersoll, 1990, Surface and airborne evidence for plumes and winds on Triton, Science, 250:421-424. Hillier, J., and J. Veverka, 1994, Photometric properties of Triton hazes, Icarus, 109:284-295. Hussmann, H., F. Sohl, and T. Spohn, 2005, Sub-surface oceans on mid-sized icy satellites and large TNOs, AGU abstract P22A-07. IAU, 2006, "IAU 2006 general assembly: result of the IAU resolution votes," IAU, on line [http://www.iau2006.org/mirror/www.iau.org/iau0603/index.html]. Ip, W.-H., A. Kopp, L. M. Lara, and R. Rodrigo, 2000, Pluto's ionospheric models and solar wind interaction, Advances in Space Research, 26:1559-1563. Jewitt, D. C., and J. Luu, 2004, Crystalline water ice on the Kuiper belt object (50000) Quaoar, Nature, 432:731-733. JPL, 2005-2006, Solar System Dynamics web site [http://ssd.jpl.nasa.gov/]. Kirk, 1990, Thermal models of insolation-driven nitrogen geysers on Triton, LPI Conference, 21:633. Krasnopolsky, V. A., 1999, Hydrodynamic flow of N2 from Pluto, Journal of Geophysical Research E, 104:5955-5962. Krasnopolsky, V. A., and D. P. Cruikshank, 1999, Photochemistry of Pluto’s atmosphere and ionosphere near perihelion, Journal of Geophysical Research E, 104:21979-21996. Lara, L. M., W.-H. Ip, and R. Rodrigo, 1997, Photochemical models of Pluto’s atmosphere, Icarus, 130:16-35. Lellouch, E., et al., 1998, ISOPHOT observations of the Pluto-Charon system: Pluto’s thermal lightcurve, Bulletin of the American Astronomical Society, 30:1061. Lellouch, E., et al., 2000, Pluto's non-isothermal surface, Icarus, 147:220-250. Licandro, J., N. Pinilla-Alonso, M. Pedani, E. Oliva, G. P. Tozzi, and W. M. Grundy, 2006, The methane ice rich surface of large TNO 2005 FY9: a Pluto-twin in the trans-neptunian belt?, Astronomy and Astrophysics, 445:L35-L38. Lodders, K., and B. Fegley, Jr., 1998, The Planetary Scientist's Companion, Oxford Univ. Press (New York). Lunine, J. I., S. K. Atreya, and J. B. Pollack, 1989, Present state and chemical evolution of the atmospheres of Titan, Triton and Pluto, pp. 605-665, in Origin and Evolution of Planetary and Satellite Atmospheres, ed. by S. K. Atreya, J. B. Pollack, M. S. Matthews, Univ. of Arizona (Tuscon). McNutt, R. L., 1989, Models of Pluto's upper atmosphere, Geophysical Research Letters, 16:1225-1228. Millis, R. L., et al., 1993, Pluto's radius and atmosphere: results from the entire 9 June 1988 occultation data set, Icarus, 105:282-297. Minor Planet Center, 2005-2006, Unusual minor planets, MPC web site [http://cfa-www.harvard.edu/iau/lists/Unusual.html]. NASA, 2005-2006, New Horizons web site [http://pluto.jhuapl.edu/index.php]. Olkin, C. B., L. H. Wasserman, and O. G. Franz, 2003, The mass ratio of Charon to Pluto from Hubble Space Telescope astrometry with the fine guidance sensors, Icarus, 164:254-259. Olkin, C. B., E. F. Young, L. A. Young, W. Grundy, and B. Schmitt, 2005, Evidence of tholins on Pluto's surface from near-IR and IR spectroscopsy, DPS abstract 37.55.02. Owen, T. C., et al., 1993, Surface ices and the atmospheric composition of Pluto, Science, 261:745-748. Pasachoff, J. M., et al., 2005, The structure of Pluto's atmosphere from the 2002 August 21 stellar occultation, The Astronomical Journal, 129:1718-1723. Peplow, M., 2006, Possible planets left with no name, Nature, 439:639. Person, M. J., et al., forthcoming, 2006, Charon's radius and density from the combined data sets of the 2005 July 11 occultation [http://arxiv.org/abs/astro-ph/0602082]. Pluto Science Definition Team (PSDT), 1999, State of knowledge of the Pluto-Charon system, at Outer Planets Program Library, NASA web site [http://outerplanets.larc.nasa.gov/outerplanets/Pluto_SDT.pdf]. Rabinowitz, D. L., et al., 2006, Photometric observations constraining the size, shape, and albedo of 2003 EL61, a rapidly rotating, Pluto-sized object in the Kuiper Belt, The Astrophysical Journal, 639:1238-1251 [http://www.gps.caltech.edu/~mbrown/2003EL61/rabinowitz.pdf]. Rages, K., and J. B. Pollack, 1992, Voyager imaging of Triton's clouds and hazes, Icarus, 99:289-301. Reinsch, K., V. Burwitz, and M. C. Festou, 1994, Albedo maps of Pluto and improved physical parameters of the Pluto-Charon system, Icarus, 108:209-218. Sasaki, T., et al., 2005, Search for nonmethane hydrocarbons on Pluto, The Astrophysical Journal, 618:L57-L60. Sauer, K., A. Lipatov, K. Baumgaertel, E. Dubinin, and E. Dubinin, 1997, Solar wind-Pluto interaction revised, Advances in Space Research, 20:295. Sicardy, B., et al., 2003, Large changes in Pluto's atmosphere as revealed by recent stellar occultations, Nature, 424:168-170. Sicardy, B., et al., 2006, Charon's size and an upper limit on its atmosphere from a stellar occultation, Nature, 439:52-54. Stansberry, J. A., et al., 2006, The albedo, size, and density of binary Kuiper belt object (47171) 1999 TC36, Astrophysical Journal, 643:556-566 [http://arxiv.org/abs/astro-ph/0602316]. Stansberry, J. A., J. I. Lunine, W. B. Hubbard, R. V. Yelle, and D. M. Hunten, 1994, Mirages and the nature of Pluto's atmosphere, Icarus, 111:503-513. Stansberry, J. A., and R. V. Yelle, 1999, Emissivity and the fate of Pluto's atmosphere, Icarus, 141:299-306. 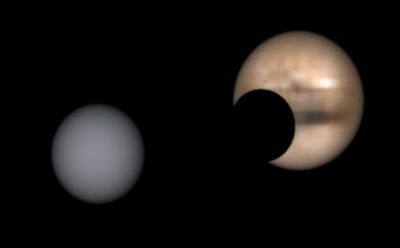 Stern, S. A., et al., 1995, Disk-resolved images of Pluto and Ceres from the Hubble Space Telescope, Bulletin of the American Astronomical Society, 27:1448. Stern, S. A., et al., 2006a, The origin of the quadruple system at Pluto, LPI Conference, 37:1241. Stern, S. A., et al., 2006b, IAUC 8686, CBAT web site [http://cfa-www.harvard.edu/iau/special/08686.pdf]. Stern, A., and J. Mitton, 1998, Pluto and Charon: Ice Worlds on the Ragged Edge of the Solar System, John Wiley and Sons (New York). Stern, S. A., and R. V. Yelle, 1997, Pluto and Charon, in The Encyclopedia of the Solar System, ed. by T. V. Johnson, P. R. Weissman, and L. A. McFadden, Academic Press (San Diego). Strobel, D. F., X. Zhu, M. E. Summers, and M. H. Stevens, 1996, On the vertical thermal structure of Pluto's atmosphere, Icarus, 120:266-289. Sykes, M., and A. Stern, 2006, Many planetary scientists and astronomers oppose new planet definition, Petition Protesting the IAU Planet Definition, on line [http://www.ipetitions.com/petition/planetprotest/Petition_Release_Planet.pdf]. Tegler, S. C., W. Romanishin, and G. J. Consolmagno, 2003, Color patterns in the Kuiper belt: a possible primordial origin, The Astrophysical Journal, 599:L49-L52. Tian, F., and O. B. Toon, 2005, Hydrodynamic escape of nitrogen from Pluto, Geophysical Research Letters, 32:L18201. Trujillo, C. A., et al., 2005a, Near infrared spectra from Mauna Kea of the new brightest Kuiper Belt object, DPS abstract 37.53.06. Trujillo, C. A., M. E. Brown, D. L. Rabinowitz, and T. R. Geballe, 2004, Near-infrared surface properties of the two intrinsically brightest minor planets: (90377) Sedna and (90482) Orcus, DPS abstract 36.11.06. Trujillo, C. A., M. E. Brown, D. L. Rabinowitz, and T. R. Geballe, 2005b, Near-infrared surface properties of the two intrinsically brightest minor planets: (90377) Sedna and (90482) Orcus, The Astrophysical Journal, 627:1057-1065. Trujillo, C. A., M. E. Brown, K. M. Barkume, E. L. Schaller, and D. L. Rabinowitz, forthcoming, 2006, The surface of 2003 EL61 in the near infrared [http://arxiv.org/abs/astro-ph/0601618]. Weaver, H. A., and S. A. Stern, 2005, IAUC 8625, CBAT web site [http://cfa-www.harvard.edu/iau/special/08625.pdf]. Young, E. F., and R. P. Binzel, 1994, A new determination of radii and limb parameters for Pluto and Charon from mutual event lightcurves, Icarus, 108:219-224. Young, E. F., R. P. Binzel, and K. Crane, 2001, A two-color map of Pluto's sub-Charon hemisphere, The Astronomical Journal, 121:552-561. Young, E. F., K. Galdamez, M. W. Buie, R. P. Binzel, and D. J. Tholen, 1999, Mapping the variegated surface of Pluto, The Astronomical Journal, 117:1063-1076. Young, L., et al., 2005, Charon Occultation Observed at SOAR and CTIO, CTIO/CerroTololo Newsletter, 83:28-30. Last modified 8 September 2006.